Computer scientists from the University of Utah’s College of Engineering have developed what they call “sentiment analysis” software that can automatically determine how someone feels based on what they write or say. To test out the accuracy of this software’s machine-learning model, the team used it to analyze the individual sentiments of more than 1.6 million (and counting) geo-tagged tweets about the U.S. presidential election over the last five months. A database of these tweets is then examined to determine whether states and their counties are leaning toward the Republicans or Democrats. 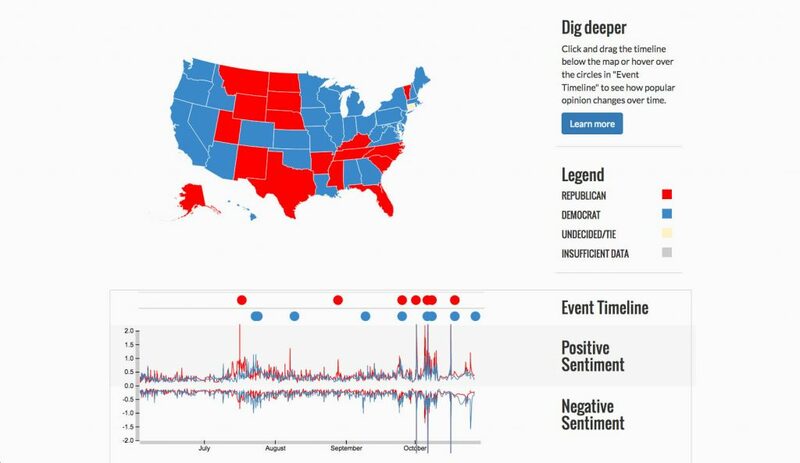 As a result of their work, the team has created an interactive website at www.estorm.org in which users can find out if the tweets coming out of their state and its counties are more positive or negative toward Republicans or Democrats during any defined period of time since June 5. Also, the data can tell you the percentage of both positive and negative tweets toward a political party and when there was a surge for a particular type of tweet in the last five months. Screenshot from estorm.org, displaying the sentiment of tweets about the two major presidential candidates. Not only did the number of positive tweets for Democrats peak after the last two debates and the Trump federal taxes story, it’s also when the most negative tweets about the Democratic Party were posted. Then those tweets were sifted through the team’s “sentiment analysis” software where each tweet was analyzed and assigned a score from 0 to 1 where 0 is the most negative sentiment, 1 is the most positive sentiment, and 0.5 is neutral. The scores are then collected in a database that can calculate a state or county’s political leanings in real time based on the tweets. The database is constantly updated with new tweets. Paul believes that their sentiment analysis software could be used to more accurately reflect the feelings of crowd-sourced opinions on the Internet, for example reviews of products on Amazon or restaurant reviews on Yelp, in which the software can “drill down to the individual sentences of the text” to determine a person’s true feelings about something, he says. He also said that voice-enabled assistants such as iPhone’s Siri could use such software to better determine what the user wants, not just based on what he or she says but how they say it.